Christopher was born and raised in Ipswich, Suffolk. 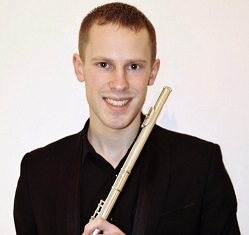 Having started the flute rather late at the age of 16, achieving Grade 8 Distinction at 17, he went on to study at the Royal Welsh College of Music & Drama and the Royal Academy of Music. He has just completed his postgraduate studies at the Royal Academy of Music, where he specialised as a principal-study piccolo player, studying with Pat Morris, Helen Keen and Karen Jones. Christopher has freelanced with such orchestras as Welsh National Opera, British Sinfonietta, Welsh Session Orchestra and Mozart Symphony Orchestra to name a few, as well as being offered work with BBC Symphony Orchestra and BBC National Orchestra of Wales. He also regularly performs with London Mahler Orchestra and is currently the Chair for University of London Symphony Orchestra. As a soloist, Christopher has performed extensively around the country performing both Mozart Flute Concerti and the Concerto for Flute and Harp, as well as Chaminade’s Concertino, Gluck’s Dance of the Blessed Spirits and the finale of C.P.E. Bach’s Flute Concerto in D minor with the Royal Academy Flute Ensemble. He was also a finalist in the RWCMD Frank Kelleher Prize, a semi-finalist in the RWCMD Concerto Competition with the Nielsen (2014) and Ibert (2015) concerti, and was awarded 2nd prize in the Instrumental Solo Competition in the 2016 Abergavenny Eisteddfod. Christopher is extremely grateful to his teachers and the charities that have supported him throughout his musical education. Christopher played Vivaldi’s Piccolo Concerto in G Major, RV 443 with the Sinfonia in March 2018.